We wanted fresh, innovative ideas and artwork. We wanted children to remember what they read, for it to have an impact on their lives. And we wanted children’s books that didn’t sanitize the biblical stories. We all want our children to have an innocent context in which to grow but we don’t want them to missunderstand. There are consequences to our actions. And YES! Children can handle heavy lessons. Anyone who has taken their kids to see the Lion King or Brave know their capacity for learning. So why carve these elements out of our biblical stories. In Daniel the king’s men are thrown into the lion’s den because of their conniving behavior. Children’s books leave this out. In Noah’s story, as the rains come pouring down, the people outside the boat are never mentioned. Without these powerful elements the moral is removed: The consequences of sin. We are a dedicated small group of writers and artist who believe that children need fresh new resources to experience their life in God. Those resources need to meet them on today’s street – where a cultural interchange of philosophies and world views compete to shape their minds. Much of the old Christian literature cannot penetrate this culture. Enter the CTCW! 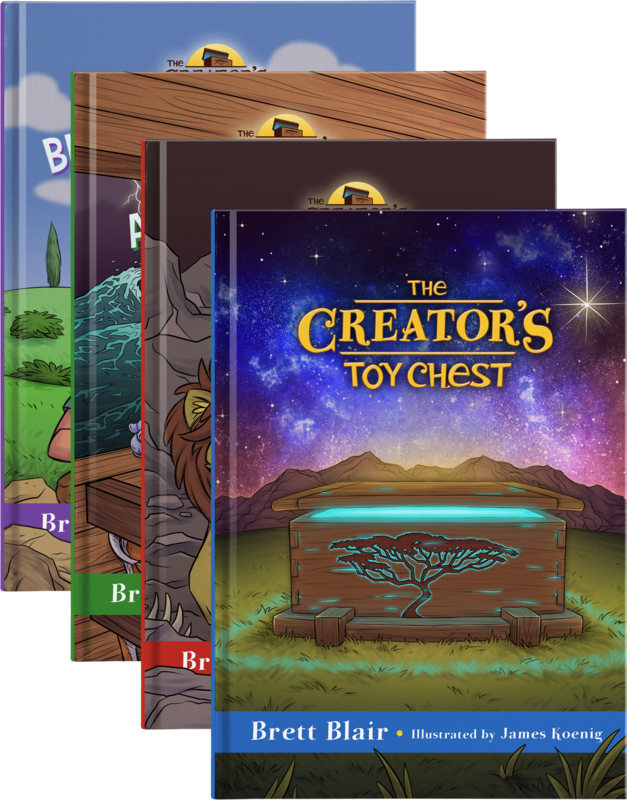 In 2019 we will publish the four-book series “The Creator’s Toy Chest.” In addition to the books, Children’s Worship Bulletins will be available for Sunday services that employ the same fantastic look, well drawn biblical characters and thoughtful games for Sunday School and worship services. We confess belief in the triune God – Father, Son, and Holy Spirit. This confession embraces the biblical witness to God’s activity in creation, encompasses his gracious self-involvement in the dramas of history, and anticipates the consummation of God’s reign. We hold that Scripture is the primary source and criterion for Christian doctrine. Through Scripture the living Christ meets us in the experience of redeeming grace. We are convinced that Jesus Christ is the living Word of God in our midst whom we trust in life and death. We affirm that God reaches out to the repentant believer in justifying grace with accepting and pardoning love. We believe a decisive change in the human heart can and does occur under the prompting of grace and the guidance of the Holy Spirit. We wanted fresh, innovative ideas and artwork. We wanted children to remember what they read, for it to have an impact on their lives. And we wanted children’s books that didn’t sanitize the biblical stories. We all want our children to have an innocent context in which to grow but we don’t want them to miss the consequences of wrongful action. Children can handle heavy lessons. Anyone who has taken their kids to see the Lion King or Brave know their capacity for learning. So why do we carve these elements out of our biblical stories. In Daniel the king’s men are thrown into the lion’s den because of their conniving behavior. Children’s books leave this out. In Noah’s story, as the rains come pouring down, the people outside the boat are never mentioned. Without these powerful elements you remove the moral: The consequences of sin. We are a dedicated small group of writers and artist who believe that children need fresh new resources to experience their life in God. Those resources need to meet them on today’s street – where a cultural interchange of philosophies and world views compete to shape their minds. Much of the old Christian children’s literature cannot penetrate this culture. Enter the CTCW! IN 2018 and 2019 we will publish the four-book series “The Creator’s toy Chest” and Children’s Worship Bulletins for Sunday services that employ the same fantastic look, well drawn biblical characters and thoughtful games for Sunday School and worship services.